I think "R" is starting to influence my cooking. 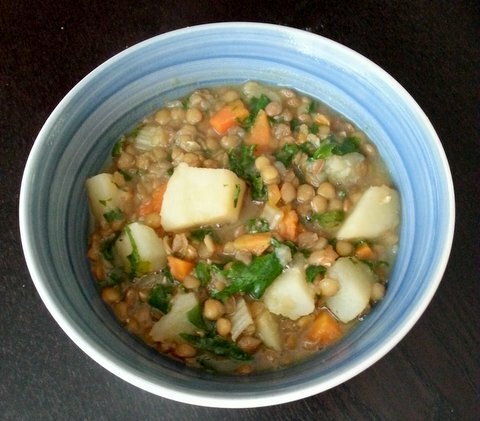 I find myself looking for lentil recipes more often and, in fact, when I got an email from him with a picture and a link to Hummusapian's recipe for Lentil Kale Potato Soup, I was in the process of creating my own lentil dish. Growing up in a European meat and potato focused home, a lentil would never have made it into the grocery bag. To this day I'm sure my mother would shrug her shoulders if I asked her what a lentil is. The superstar quality of this fibre and iron rich bean is worthy of paying attention to. Spend a few minutes browsing through the Lentils Canada site. So much information and great recipes too. 1. Heat olive oil in a heavy-bottomed pot over medium heat. Add onion, celery and carrots and sauté until softened, about ten minutes. 2. Add lentils, broth, water, salt, garlic, cumin and coriander. Stir together and bring to a boil. Once soup has reached a boil, reduce heat to low and simmer covered for 20 minutes. 3. Add chopped potatoes and simmer, covered for 15 more minutes or until potatoes are fork tender. 4. Add kale and simmer covered for 5 more minutes or until kale is wilted. 5. Remove from heat and stir in red wine vinegar. Season to taste with salt and pepper. This is one of the better pictures "R" has taken of late. The plate is actually centred in the photo. I tried to salvage the clarity but we need to work on the photography skills.